"The Worst Doesn't Unhappen, But . . ."
Amy Gentry's superb first novel. Lists, lists, lists. The best books of this month, the best books of this week, the best books of this Tuesday … on and on. And of course we have the fiction shortlists for the Man Booker Prize and the National Book Award. What these quite various lists have in common is that I (a heavy fiction-reader) only rarely find on them the books I have most enjoyed. Weird. 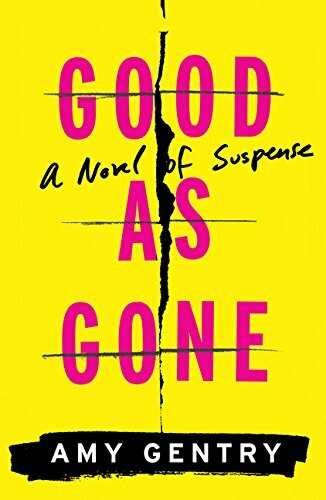 One book that would be on my shortlist for 2016 is Amy Gentry's Good As Gone, a superb first novel. Warning! Please do not google this title. (Don't read the copy inside the dust-jacket either, should you pick up a copy to browse.) Most descriptions I've seen tell you too much about the book, or frame it in unhelpful ways, even if they are enthusiastic. This is a novel that needs to unfold in your imagination with no intrusive guides. That first reading (if your experience is anything like mine) will be immersive; before you've even finished the book, you'll know that you want to read it again (as I already have, twice). It's fair to say (as Gentry herself has acknowledged) that the story was inspired by the case of Elizabeth Smart, who (as a fourteen-year-old in 2002) was abducted from her bedroom in Salt Lake City. But it is not a fictionalized retelling of Smart's experience. What is it, then? It is, among other things, a book animated by anger—especially anger against sexual abuse of women, but not only that. Anger at hypocrisy, too, and in particular against bent Christianity. (The book is set in Houston, and one of the characters is the slick pastor of a quasi-evangelical megachurch.) The novel includes a brief travesty of one of my favorite books of the Bible. You may conclude, from this account, that Good As Gone will not be your cup of tea—or you may be rubbing your hands with glee, saying This should be fun. And maybe you'd be right in either case. But maybe not. Because the suspense in this book derives not only from the twists and turns of the story and its sinewy sentences but also from the reader's own changing perceptions of the author's intention, her "point of view" not just as a storyteller within the frame of the book but as the human being who told this story that adds up (as all novels do) to a little model of the world we all share. You might suppose, early on, that you know pretty well what that model will look like (whether or not you feel that she's a kindred spirit); you will probably be wrong.